When you have a newborn, safety is the primary concern when purchasing a product of any kind. The DayDreamer Sleeper was designed with safety and reliability in mind. Good sleep in the right amount is important for infants but often can be troublesome for parents. Car seats were not designed for long-term napping sessions and placing a baby in a nursery crib can lead to anxiety and constantly checking the baby monitor, especially when the baby is sick or congested. The DayDreamer Sleeper resolves both concerns and does much more. From the very first blueprint that was created, the safety and comfort of the baby was always a priority. The DayDreamer Sleeper was created by an infant product specialist with input from new parents. DayDreamer Baby Sleepers use an ergonomic 28-degree incline that not only helps the baby get comfortable and stay asleep longer. The flat base and contoured walls of the DayDreamer Sleeper ensure the sleeper is always secure and stable. Babies can be very picky about where they sleep, especially when it’s uncomfortable. The moisture-wicking fabrics, as well as the perforated inner core, help the baby stay cool and prevent overheating. The material of the baby napper is soft to the touch and helps babies relax faster and stay asleep longer. No matter where mom has to go during her busy day, she can bring the DayDreamer Sleeper with her and the baby. There is also a safety latch on the napper to ensure that the baby does not climb up or fall out of the DayDreamer Sleeper. Tension tests make sure that all of the mechanisms are working properly and will be able to maintain the baby’s weight. 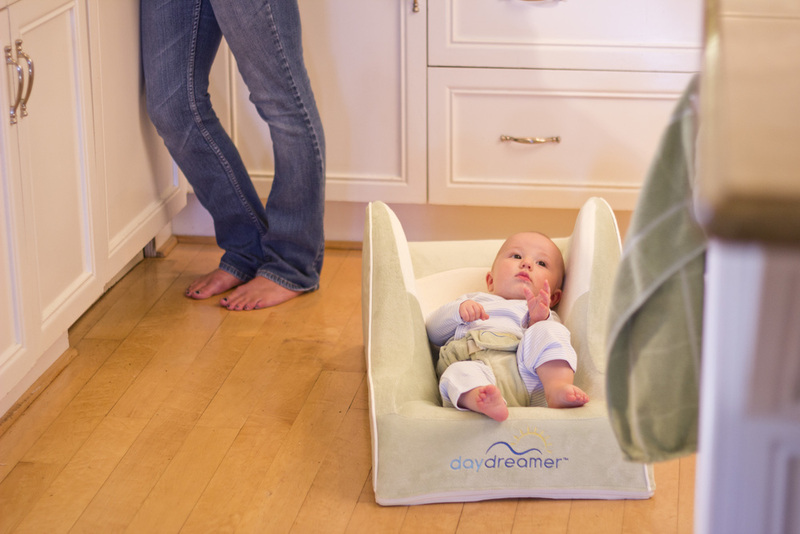 No matter the size of the infant, the DayDreamer Sleeper will remain stable and secure as they take a peaceful nap. Moms can rest assured that they can place the DayDreamer Sleeper on any flat and stable surface on the ground and keep their child safe as they take care of other chores for the day. All of the features in the world would mean nothing if the DayDreamer Sleeper baby napper wasn’t totally safe. The actual design of the DayDreamer Sleeper has been in the works for over 20 years. It addresses the basic needs parents have while adding improvements over existing devices, such as the chair and sling design. Both of these were not created for extended use, and that’s what makes the DayDreamer Sleeper so different from any other baby nap chair. The DayDreamer Sleeper meets the needs of both the infant and the mom, ensuring that comfort and security are always at the forefront. The high sides of the DayDreamer Sleeper provide extra security and prevent the baby from trying to reach over for toys that have fallen. The design of the DayDreamer Sleeper makes it optimal for any flat surface on the floor. From the beginning, the DayDreamer Sleeper was meticulously created to comply with all federal laws and also exceed the standards outlined by the U.S. Consumer Product Safety Commission. Extensive testing was conducted on the DayDreamer Sleeper to test it against every possible type of environment in the home. Tests were also conducted to ensure that all materials used were safe around infants. The sleeper was tested at an independent testing facility, that claimed the DayDreamer Sleeper to be the safest baby napper on the market. It met and surpassed all testing regulations and requirements.